Congratulations on another fine season, your ECACHL Coach of the Year Award, and Penrose Award Finalist nomination. Although I'm sure you would have preferred to play two more games, you and the team have given Cornell and ECACHL fans plenty to be proud of. This year, you picked up your fourth league championship and Cornell's eleventh. However, many fans still miss the atmosphere Lake Placid offered. Are you pleased with Albany as the site for the ECACHL tournament? If it were up to you, would you prefer to see it back in Lake Placid? The atmosphere in Lake Placid was great for the fans during the course of the day. I agree with the decision to move the ECACHL Championship to Albany for a lot of reasons. The very first and most important reason is the Olympic-sized ice sheet in Lake Placid, just like in Minnesota. It is absolutely ridiculous to go to the Olympic-sized ice for the championship games when the teams in the league have played all their games during the season on the smaller sheet of ice. The second thing is the atmosphere in Lake Placid. Again, maybe it was great away from the rink, but during the games, the teams couldn't hear much noise from the fans. There wasn't a great atmosphere for the fans to be right on top of the action. With the Olympic-sized ice there wasn't as much hitting and physical play, and you see more of that in Albany. It is a different style of hockey. The biggest thing for the fans, even though the atmosphere is not the same, is that it is more affordable for people to attend. There isn't the mandatory two or three-day stay in a hotel and it was quite a distance to drive to Lake Placid. People can now drive up to Albany for the day and go home if they wish that same night. "It is absolutely ridiculous to go to the Olympic-sized ice for the [ECACHL] championship games when the teams in the league have played all their games during the season on the smaller sheet of ice." Many of this year's seniors started their Cornell careers as role-players, but under your guidance, they each became integral parts of the team that will be difficult to replace. How is next year's team shaping up in your eyes and is there anything you can tell us about the Class of 2009 beyond what we can see on score sheets? I can discuss how next year's team is shaping up, but I can't discuss each individual in the Class of 2009 until we send out a press release. I think that the seniors, like many other senior classes are career role players. When we recruited the seniors, we thought Charlie Cook would be an offensive defenseman and he obviously fulfilled that role. We recruited Paul Varteressian to be a physical player and he fulfilled that role. We recruited both Mike Knoepfli and Mike Iggulden to be goal scorers. Mike Iggulden, despite all his injuries, blossomed into an outstanding player and Mike Knoepfli established himself as one of the best two-way players in the league. Jeremy Downs did exactly what we thought he would do. I find it funny that people really underestimated the senior class. Those five guys contributed 26 goals up front and with Charlie's nine goals from the blue line, we lose a lot of offensive, but we also lose a lot of character. Each year it is tough to replace the seniors. With next year's team we will have a good core nucleus back, but it is always interesting to see how individuals improve over the summer and how quickly the freshmen adjust to college hockey. Since you returned to Cornell, the team's style of play has obviously been defense-first. But with players like Justin Milo and Tony Romano on the horizon, is there a shift in recruiting strategy? I cannot comment on Milo and Romano. We have not changed our recruiting strategy. Our recruiting strategy is to look for kids with very good work ethic. They need to be competitive, have a very good hockey sense and have good character. If players have this kind of mentality and quality, they will pay attention to being strong two-way players and not just defense first. We are also graduating some offensive players like Matt Moulson, Shane Hynes and Daniel Pegoraro. We need to bring in the type of players that can do the type of things that these guys do for us and this influences how we recruit each year. Those guys will play both ways and have committed to that. We are very honest in our recruiting process on how we like to play. There has been no shift in our recruiting strategy at all. Speaking of recruiting, news of the planned renovations to Lynah Rink has been spreading. The atmosphere in Lynah speaks for itself when experienced in person, but do you believe the renovations will be sufficient to compete for top talent in light of the new rinks being built around the country and do you foresee expanding the scope of recruiting beyond the BC and Ontario channels that have served you so well? Some of the things that we are trying to renovate in Lynah Rink are the locker rooms, training room and everything that both the men's and women's teams use on a daily basis. We are looking to improve their life inside the rink. Our actual game night atmosphere is hard to match across the country and when kids come in on recruiting visits they see this. With the renovations, we will continue to get the same kind of talent pool that we are currently seeing and that won't change a whole lot. Lynah will continue to recruit for itself with the game night atmosphere and once players see the supporting facilities they will be very impressed. "[The seniors] contributed 26 goals up front and with Charlie's nine goals from the blue line, we lose a lot of offensive, but we also lose a lot of character." Much was made of Cornell's placement in the NCAA West Regional. What adjustments were made to Cornell's game plan for the Olympic-sized ice and what are your thoughts on the lack of conformity in NCAA rink sizes? Everyone was disappointed to be chosen for the West Regional, since it would make it harder for our fan base to travel and support us and because of the Olympic-sized ice sheet. I don't think people realize that we are fit for the Olympic sized ice sheet. We have one of the better skating teams in the country and I laugh at all of the comments that Minnesota skated circles around us. In the game we had to kill off six penalties in the first two periods. Our game plan going in was to take away the middle of the ice since they practice and play on this ice surface day in and day out, and not to give away quality shots. They are a team that brings the puck to the net a lot, so we were not going to give that to them. We are a strong team around the slot and David is good at controlling rebounds. For the most part, that is what happened in that game. Once the third period started, the officials put away their whistles on both teams so we were able to play five on five. It's not so much that we made adjustments in the third period, it's that we could play five on five. If the NCAA is hosting the final championship on Olympic-sized ice then I think an Olympic sheet should be added during the course of getting there. If it won't be used in the final, than I don't think the Olympic sheet should be used anywhere during the playoffs. It's a tough battle to fight. Where other coaches do little more than talk about scheduling teams from the developing conferences, you've stepped up and scheduled teams like Mercyhurst, Sacred Heart, and Canisius. Next year's schedule seems to be largely in place, and again, Cornell will be facing teams like Niagara and RIT. While this may be good for those teams and the sport, the Ivy League game limit means quality out-of-conference opponents will be limited to the pair against Michigan State and the Florida College Classic games. As we saw this year, that leaves very little room for error, as having only four losses was still not enough to earn a number one seed in the NCAA tournament. Is there a point where you have to look out for Cornell's best interest and schedule stronger teams or be more flexible with your demands for reciprocity in scheduling? Everyone talks about scheduling and I'm the one who does the scheduling. The scheduling people think it is an exact science, but when you look at the schedule after you take away our Florida tournament, there are only about three dates when we can play during the course of the season and we are not like a New England team where we can play during the course of the week. It leaves us very little time. Our league has changed and we have only known our league schedule a couple years in advance so there are very few times where we can play teams. Once that is set you start looking at teams across the country. Many teams will not travel and so that takes away a lot of opponents, so you end up with a very small pool of teams that you can play. The Florida tournament has always given us some quality opponents and we always try to play quality opponents. We continue to try and play teams like UNH and Maine and different teams from across the country that will come here and we can go there. The number one seed in the tournament is overrated right now. If you wanted a better placement, we would have been better off being a lower seed because there isn't a lot of difference between Minnesota and Ohio State. The number one seed was really critical when you had fewer teams. You are always subject to them moving you around. The scheduling aspect is important. It's tough to get games based on our schedule. We are what we are in the ECACHL. Because we start the season so late, it doesn't do any good to be careful about whom we schedule as our non-conference opponents and where we play. We need home games. We are a team that needs to support our Athletic Department and bring in money, just like anyone else. It does our department and University no good if we are traveling all over the place and not playing at home. We owe it to our fans to play home games. Do you believe the problem is with the selection criteria and is there something you would like to see change? I do believe there is a problem with the selection criteria. The biggest thing is the weight that they give to the RPI Index. Our RPI Index was two points higher than Minnesota and we only get one point under teams under consideration head-to-head. They played Michigan State at home at Thanksgiving and we played Michigan State early in the season at their rink. We go 0-1-1 and they went 1-0 and it is giving the same weight. There are some real serious issues in how they deal with head-to-head. It's important to the NCAA because they take money from institutions like Minnesota in order to have a strong regional, but then it's not important to them when they place a team like Cornell out West when we have a large fan base and the stands were relatively empty in the East. There are some issues as far as what is going on right now and we try to address it every year at the American Hockey Coaches Convention in Florida. The other part of this equation is quality of your conference competition. There is great disparity between the top and bottom of the ECACHL at the moment. 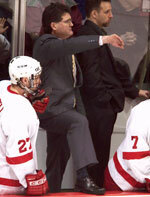 Union's president Roger Hull stated that he was proud when his hockey team won forty percent of its games. Vermont returns to form just in time to leave for Hockey East. The ECACHL's television package is still lagging far behind the other "big 4" conferences' deals. Are you satisfied with the commitment shown by the other ECACHL schools, the conference, and for that matter, Cornell's administration? I think our league mirrors some of the other leagues. Right now people say there is great disparity between the top and bottom of the league. Clarkson is a pretty good hockey team, as is St. Lawrence and people say there is a lot of disparity between the top and bottom, but I don't believe that. Every league has a team that lags way behind and this year it was Yale. I think Yale is going to have a pretty good team next season. As for the teams that were in the bottom part of the league, you had Clarkson and St. Lawrence. These are good hockey teams. Clarkson beat Ohio State twice at home and St. Lawrence went to Maine and beat them then went into Michigan State and beat them and lost a game at Michigan. "We have one of the better skating teams in the country and I laugh at all of the comments that Minnesota skated circles around us." The television package is what it is. With the exception of the WCHA, other leagues like Hockey East have some teams on, but not very many. The only teams on in the CCHA are Michigan and Michigan State, so they don't really have big conference deals. The ECACHL is a league of small market teams. We have teams that are very committed to being successful. The conference continues to try to do things to make the league more successful. We took some huge steps and we need to continue to do more things to become more successful. The conference is headed in the right direction. Cornell's administration, again, just like other administration, takes its knocks, but our success wouldn't be what it is if it wasn't for their support. They have done everything behind the scenes for us to be successful: supporting our recruiting, our equipment, our team travel. They have done everything that we have come forward and asked for to make us a team that competes on the national level, so our administration has probably been one of our biggest supports. ECACHL officiating has been sharply criticized by coaches and fans. Do you believe this is a problem endemic to the ECACHL or is it a general problem in college hockey? If the problem is with the league, what is the solution? There are officials in every league that are criticized, but I think the officials in our league overall are pretty solid. There are issues in every league. The biggest thing was the officiating initiative this year. That was a problem that needed to be addressed, but it has gone from people getting mugged on the ice to not being able to touch anyone now. It is letting the worst possible thing creep into the games, and that is diving. I think the officials need to take the next step by really enforcing the rules of a dive, and the referees can't be afraid to call this. Every time someone goes down and they feel he isn't respecting the game, they won't make the call. I think we were a team that was punished at the end of the season because of this. I can't stand our guys diving all over the ice to draw calls. I believe it hurt us down the stretch drive, especially in the NCAAs. When referees aren't used to our big, strong team they will call the game accordingly. It's an issue that you live with every year. I think they need to address the issue of diving because it is running rampant and hurting our game more than the clutching and grabbing. It is the worst possible thing that can happen to our sport. Finally, by popular demand, what is your favorite hockey movie? Favorite movie is, of course, Slap Shot.